Hereford United's fundraising fans are close to hitting the £78,000 target they need to keep the club alive. The Bulls face a winding-up petition in the Royal Courts of Justice in London on 7 April over an unpaid PAYE tax demand from HM Revenue and Customs. If they are wound up on Monday then they will cease to exist immediately. But they are now within £20,000 of the target, helped by a series of fundraising events, including a special show involving comedian Omid Djalili. 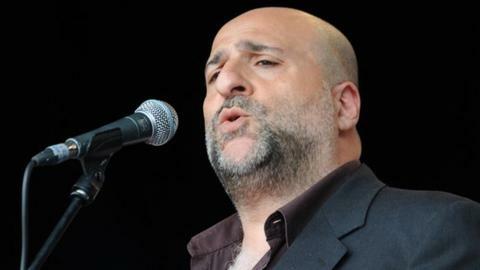 This Sunday's stand-up gig at the Courtyard Theatre in Hereford, at which Chelsea fan Djalili has offered his services for free, is to raise £20,000 on its own. Taking into account what we forecast to receive we think we're left about £16,000-£20,000 short. And, working together with their two fan groups, the Hereford United Supporters Trust and the Hereford United Independent Supporters Association, the club hope that a decent attendance at Saturday's home game with Woking, coupled with further bucket collections, will see the Bulls survive their latest financial deadline. "Taking into account what we forecast to receive over the weekend from gate receipts, bar takings and additional income we think we're left about £16,000-£20,000 short," said Bulls director Dave Preedy. "It's a more manageable figure, but we need one final push from the fans who have already been absolutely superb. "We need to continue fundraising right up until the last minute to hopefully avoid a winding up order that could put to an end to our 90-year history." The Bulls have already overcome one winding-up threat this season, in late January, over the non-payment of a £36,800 PAYE bill. Chairman David Keyte, who has already pumped in more than £600,000 of his own money since taking over as chairman in the wake of Graham Turner's departure in June 2010, has hinted that there might yet be a rescue bid from potential new investors. Nothing to laugh about . . . But the club reported losses of £499,000 for the year ending April 2013 at their annual general meeting last month. And, working on average gates this season of just 1,703, a figure swelled by Saturday's massively-improved crowd of 2,545 for their last home game with Grimsby Town, the cash-strapped club are losing money by the week. They are overall attracting considerably less than the 2,000 break-even figure for home gates outlined by Keyte, and he has already warned that they need £300,000 just to see out the current season. Hereford do have long-term plans to raise money by the commercial redevelopment of both ends of their council-owned ground at Edgar Street, but they have been told that they cannot expect direct financial assistance from the local authority, Herefordshire Council. Hereford's heartening fight for survival off the pitch has so far not been reflected on it at Edgar Street. Since the enforced January deadline day sale of star player Josh O'Keefe to Kidderminster Harriers, the Bulls have not won in 11 matches, drawing just three of them. Their decline has remained unchecked by the sacking of manager Martin Foyle a fortnight ago and they have now slumped to within a point of the Conference Premier relegation zone.